Today the world lost a great soul. Reb Zalman Schachter-Shalomi (Meshullam Zalman Hiyya HaKohen ben Hayyah Gittel) passed away peacefully at his home in Boulder, Colorado, aged 89. Reb Zalman was the founder of the Jewish Renewal Movement, the mentor of numerous rabbis, and a guiding light in the lives of innumerable souls. He was a dear friend of my father’s, and was invested by my father Pir Vilayat with the rank of Shaikh in his Order. In this capacity, Reb Zalman revived the legacy of Rabbi Abraham ben Moses ben Maimon and established a Judeo-Sufi branch of the Inayati lineage known as the Maimuniyya. Netanel Miles-Yepez (Murshid Mu’in ad-Din) succeeds Reb Zalman in this line. other peacemakers and pilgrims, the rocky path that leads to the peak of Mt. Sinai in the Egyptian desert. We ascended the holy mountain in the predawn darkness, and as the sun slowly rose over the horizon Reb Zalman sang joyous chants of divine praise. Standing on the summit, one could see the wiratha of Hazrat Musa (‘alayhi as-salam)—the inheritance of Moses (peace be upon him)—radiating from his face. Reb Zalman’s rabbinic and kabbalistic erudition, his breadth of vision, and most of all his vastness of heart will never be forgotten by those whose lives he blessed with his presence. To me, Reb Zalman was a wise and affectionate spiritual uncle to whom I would turn at times for counsel and inspiration. I will keenly feel his absence, though I know his spirit is by no means lost to us if we know where to seek him. his beloved wife, his children and grandchildren, and all who are left bereft by his going from this world. 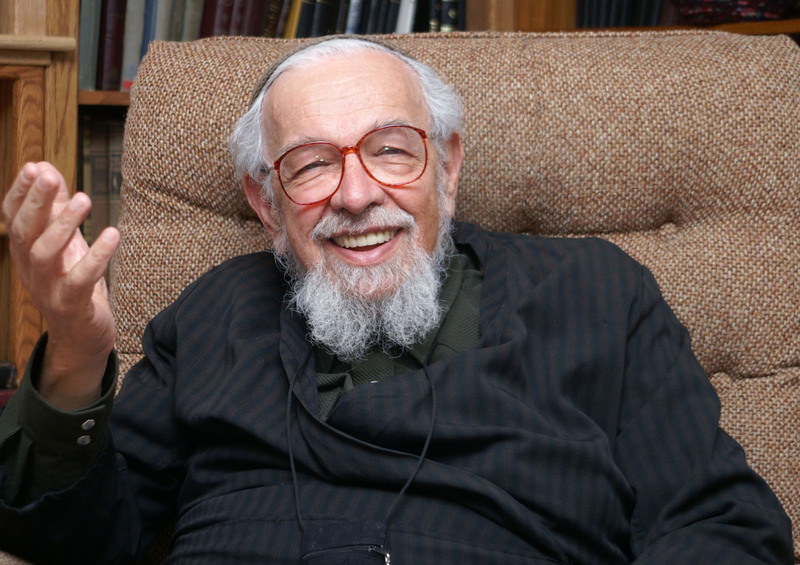 With God’s blessing, may Reb Zalman’s treasured legacy flourish for ages to come. Our dear friend, teacher, fellow sufi traveler and helper to the worlds, Reb Zalman has left this world and is on his Journey for new ways to serve on July 3rd! May his Adventure be filled with Bliss and Profound Presence! One of my sweetest memories was from the early 1970’s when the Sufi Choir and Reb Zalman all stayed together at the Garden of Allah and had a weekend retreat together of stories, music, love and intimacy of the Heart! As you likely know Reb Zalman is an honored Sheikh in our lineage. When our son Solomon died in January 2012, Reb Zalman called us and shared practices from the Jewish tradition of sacred phrases, one per week for seven weeks, very much like doing prayers while someone is in the “Bardos” (Tibetan for “in-between”). He translated the Hebrew into our Arabic wazifa phrases. I offer them here for those of you who want to involve in this form of prayers for his Journey! So I invite you to all join me. I will also recite YA SALAAM every day. Yes, I will be joining you in these prayers, too. I had the wonderful opportunity to have passed the recent Shavuot holiday in Connecticut at the final retreat with Reb Zalman before his entry into the hospital nearby. Historically, at this annual retreat, Reb Zalman had always let us know that the retreat at hand could be his last, and that we should accept his transmission and carry it. He liked to use computer metaphors, so he told us to just sit in his presence while he “downloaded” into our consciousness. This year, however, had an even more immanent feeling about it, seeing our beloved Rebbe with the oxygen tubes among the many tubes and organs in our body that we acknowledge in morning prayer, saying he probably would not make the trip again. At our last meeting, Reb Zalman gave us instructions, and in response to Bodhi’s question about HOW Reb Z wanted us to pray, I tried to reconstruct his directions, but the right brain was really engaged and the left one forgot to record the specific sequential instructions. I will relay what I remember, and ask forgiveness if my limited memory does not do justice to the teachings. Reb Zalman asked that we pray, twice a day, for 15-20 minutes. He ( maybe influenced by Murshid Sam’s one-minute theory!) said that if he asked more, we would not do it. He said we should use Hebrew as a common prayer language when in congregation, but that for our personal prayer, we should use our first or most fluent language. We should also use a voice of sufficient strength to be audible to our own selves. He told a story, and I can’t remember the actual people in the story, of someone asking their rebbe for a big favor: to recite with the student, with all of the rebbe’s kavannah, or intention, a particular prayer. Reb Zalman then asked us fro put our hands on our hearts, as he put his hand on his heart. He then guided us in the form of our prayer. First, to call to awareness all the great awes and wonders that we see each day, that help us to recognize the presence of the divine in all of creation. Normally, I would hold in confidence anything that I heard in a prayer session, but with respect to Reb Z, I’ll share that I overheard him, during the litany say : Frogs! Then to express gratitude for our own lives, and the personal gifts we have received, like families, friends, health, prosperity…. Then to enter fully into the Presence, acknowledging all that, and asking for peace, health, sustenance, whatever are our needs. I don’t remember the exact transition back down through the realms, but he said it is especially important to “Seal the deal!” with gifts to charitable causes and works of justice and kindness. Reb Zalman also says he uses the psalms, especially, in his prayers, and has published books of his own translations of the psalms in language many of us can relate to. He also has books on praying with intention, and books on aging consciously. He encouraged us to use niggunim, wordless melodies, on a regular basis to change our consciousness. He said, “If you say you don’t know any, just try using Amazing Grace,” which we did together, with much success. Reb Zalman reiterated, as he had so many times, that he was happy with his work, and that Judaism, as a living tree, needs the juicy sap of the growing, experimental edge to keep it alive, and that that is what he feels that he has offered the Jewish people. He said that we are all one nation, and that the organism needs, in addition to the growing edge, the strict Orthodox to stabilize the skeletal framework, just as the living tree has the dense, sturdy dead wood in the center. He also said that the Jews, as a people, are just one organ among the many, in the living organism of the world’s peoples, that is just one aspect of the greater organic being. He expressed concern, as he had many times in the past, that he doesn’t care much for the “brand” of Jewish Renewal because many think it just “Judaism Lite.” He implored us to deepen in our practice, constantly examining and interpreting Torah in light of our own experience and realities of the day. He said he felt that his students were making good progress with rituals and observances of welcoming the Shabbat on Friday nights, celebrating on Saturday morning, and ending Shabbat with Havdalah. He encouraged folks to take on more, with the Third Meal table and study session on Saturday afternoon. As Reb Zalman was leaving our final meeting, someone carried off his breakfast, which he had not had time to eat. Left on the table, were an almost-empty coffee cup, a fork and some clean napkins. I was looking at them debating whether to keep one of the rebbe’s napkins as a keepsake, when my friends Lois and Susan asked me to “Please take that stuff.” I assumed they meant to take it to the trash or the kitchen, and I told them I was debating keeping a napkin. They said no, to take it to Reb Zalman with his breakfast! When I got it to him, I asked if he wanted a fresh hot cup of coffee which he did. When I asked how he took it, it was with cream and sugar! YES!!! I drink my coffee just like my Rebbe! May his memory continue to bring unity, understanding, and consciousness to the world! Ya Salaam, Reb Zalman, ya Salaam! May we all be inspired to new acts of generosity, kindness, peace, and justice, in your living memory! I first met Reb Zalman in Philadelphia. Aftab took me to his home for an evening of Love, Prayer, Dance, Joy and Laughter. I am grateful for our paths crossing so many times in this lifetime. Thank you for all the love you brought into this world. I know you had a great celebration when you arrived home. Thank you for your bright life and for all you shared. Journey well, enriching all as you go, just as you did in this sojourn. Living in Australia I only heard stories of Reb Zalman and read several of his books and saw him on video until a few years ago a miracle happened! Even though he was getting older and frailer he decided he really wanted to come to Australia and in his 83rd year, I think it was, he did come and we had the great privilege of his presence in the Sydney Jewish Renewal group, which was affiliated with the Temple Emanuel at the time. After teachers like Cantor Robert Esformes and Rabbi David Cooper, who were both his students, we finally got the master himself. There was so much light that emanated from this extraordinary being and so much love! For me as a Sufi student he represented that special connection between the Jewish and the Sufi traditions that Pir Zia speaks about above. It is a tradition that goes right back to Moses and his father-in-law and Desert Wisdom Master, Jethro, who was his mentor as well. light” still thrives in the Boston area. ritual would be more meaningful to me . and joyously sat in front of us, we entered the Sufi practice of Darshan. and others and did so by calling it an ancient Jewish practice. gift for visual art, our son created drawings of this experience of Moses. Judaism, not leave it and his own guidance eventually affirmed that. harmony on the individual community level as well as global stage. continues with a life of its own. teaching with him was seemless, out of the box and quite ecstatic. in the possibility of fulfilling their own dreams and life purpose. Rabbi Zalman Schachter Shalomi, founder of the Jewish Renewal movement, and one of the most creative and impactful Jewish theologians of the last forty years, died today (July 3rd). I write with tears in my eyes and love in my heart for this incredible teacher, a source of inspiration for literally hundreds of thousands. I loved this man very very deeply for the past 51 years that I knew him. Zalman was born in Europe and barely escaped the Nazis when he was able to flee from France to the U.S. He became a Lubavitcher Hasid and Rabbi in Brooklyn, and was chosen by the rebbe along with his friend Rabbi Shlomo Carlebach to reach out to the generation of Jews coming of age on college campuses in the 1950 and 1960s. Zalman served as a campus Hillel rabbi, and there tapped into the emerging new consciousness that we subsequently called “the counter-culture.” His experience with LSD and other hallucinogens opened for him a deeper level of experience that fortified rather than undermined the spirituality that had always sung to his heart and which had been the inspiration for much of the Kabbalistic and Hasidic movements. I was first introduced to Zalman by my mentor at the Jewish Theological Seminary, Abraham Joshua Heschel, and am forever grateful for the relationship that we developed after that. As a counselor at Camp Ramah, I invited Zalman to teach my campers some of the ways to pray the “Shma” prayer—and these 13 year olds were mesmerized by Zalman’s ability to translate deep spiritual truths into a language they could understand, and then to embody his teachings in the way he actually led the davvening. So it was no surprise to me that after Heschel died, Zalman became the de facto leader (or perhaps co-leader with Shlomo Carelebach) for all those Jews seeking a spiritually alive Judaism. To develop that approach more fully than he could in academia (he had been teaching at a college in Philadelphia), Zalman helped create the Aquarian Minyan in Berkeley, and then in Philadelphia he developed B’ney Or with its attempts to spread the kind of spiritual vision he had developed. Unlike Shlomo Carlebach and many of his colleagues in Chabad, Zalman became a champion of a creative approach to Halakhah, always asking what was the goal of the Halakhic injunctions, and then finding creative ways to make those goals come alive in the experience and imagination of those he was teaching. Yet at the same time, he was strongly attached to the orthodoxy of his mentors in the Chabad movement, and the wisdom of the Tanakh, Talmud, Kabbalah, and Hasidut. When he began ordaining rabbis as part of the new Jewish Renewal movement he was creating, he insisted that we observe the mitzvot, particularly those regarding personal status (birth, marriage, conversion to Judaism, and death). He wanted to be sure that his ordinations were recognized in Israel and in the orthodox communities of the U.S. in order to ensure that he wasn’t participating in further splitting the Jewish people. Zalman quickly became a champion of women’s voices and the centrality of women’s experience and wisdom in Judaism, and not long later a champion of equality of treatment for homosexuals in Judaism. He was in the vanguard of giving rabbinic ordination to women and gays. Not surprisingly, his experimentation with drugs plus his deep feminism and support for equality of treatment for gays caused Chabad to break from him. I started studying with Zalman in 1975 as one of his students and then later as an official rabbinic student, and he picked two other orthodox rabbis to be among the five rabbis who would eventually give me smicha (Jewish rabbinic ordination). What was striking to me was how important it was to him that I be able to pass the tests that any orthodox kolel (rabbinic supervision group) would put to their own rabbinic students. By the time he gave me rabbinic ordination in 1995, I had written my book Jewish Renewal: A Path to Healing and Transformation, which became a national best-seller and brought much of Zalman’s sensibilities to a larger audience than had heard his teachings before or after. Zalman was a founding member of the Editorial Board of Tikkun magazine, which was and is the only national magazine that actively identifies with the Jewish Renewal movement. Tikkun became the one Jewish publication that he could count on to print his prayers, his translation of psalms, his own essays, and to promote many of those to whom he had given smicka (rabbinic ordination). He performed the wedding ceremony for me and the co-founder of Tikkun Nan Fink Gefen in an orthodox shul in Oakland, Ca. What was most amazing about Zalman was that he continued to grow throughout his life both intellectually and spiritually. I remember countless discussions with him on topics ranging from advice about how to deal with issues in Hallakhah that rose in my congregation Beyt Tikkun to how best to ensure that his legacy would retain the integrity of his message after he died; from current developments in Israel (he shared the pain I felt about the direction of policies that did not respect the Palestinian people, but felt unhappy that we at Tikkun were so “out there” in reporting the details of how oppressive the Occupation had become), to discussions we had about Levinas, Heschel, Buber, and even about Ken Wilber and the limits of his world view that was sweeping some people off their feet in the 1990s. What was always remarkable was how sweet he was, how caring, how he would make himself accessible to so many people, and how sophisticated his psychological insights and spiritual depth remained right till now, just a month before the Jewish Renewal movement was to celebrate with him his 90th birthday (though he told me that he had only reluctantly agreed to this celebration in order to help Aleph, the organization that was now the official voice of Jewish Renewal); and he often shared with me his disappointment that the movement he had founded and led for so long was not giving more attention to tikkun olam and more support for Tikkun magazine, and so he mentioned in his last talk to Jewish Renewal rabbis (at Ohalah January, 2014) that they should give more attention to the ideas that Arthur Waskow and I have been putting out in the past years, and he told me he wanted to convince the rabbinic training program of Aleph to make a ‘tikkun olam’ track along the lines that Waskow and I have helped develop into a mandatory part of rabbinic training the way the davvening track is mandatory. Sad for our Jewish Renewal movement that his sickness interfered with his following through on these directions. It’s hard to sum up how impactful Zalman Schachter Shalomi’s message has become. The spiritual aliveness and creativity that he pioneered shaped the thinking of Rabbi Marshall Meyer who turned a failing conservative synagogue on the Upper West Side of New York, Bnai Jeshurun, into a cauldron of spiritual energy in the 1980s and 1990s. His teachings and approach to prayer has seeped into the Reconstructionist movement (he sometimes taught at their rabbinic training program in a suburb of Philadelphia) and into the Reform movement and parts of the Conservative movement as well (sadly, many of those who have now adopted some of the approaches to prayer or theology that he pioneered learned it from others and are not even aware of how much they are defacto students of Zalman and perpetuating his legacy; but in any event he was not locked into ego, and it gladdened him when others followed his path without even knowing that that was what they were doing). i first met magical reb zalman schachter in the late 1970’s in los angeles. my future husband, jay, and i organized a shabbaton with him at stephen s. wise temple. we had jewish hippies sleeping in sleeping bags in hallways, eating delicious vegetarian food, and being blown away by reb zalman. no one had ever encountered anyone like him, before or since. later, jay became the treasurer for aleph and our family attended ohalas in boulder, and kallahs all over the country. zalman led part of the kids’ play that my daughter was in, and he drifted around one evening talking to all of us. he thought i was the lawyer from santa cruz, and i said that was my husband and i was the therapist. amazing how many people he had met all over the world, and filed them away with details for later. our incredible jewish renewal community in santa cruz, chadeish yameinu, will always remind me of zalman and his legacy. he brought the deep spirituality back into my life, the part that was missing from my conservative temple growing up in brookline, ma. it felt very superficial to me, just chant the prayers without knowing what they mean. we had “girls school”, which was less days and meant no bat mitzvahs. thank you, reb zalman, for changing the whole international interfaith spiritual community, for opening our eyes and hearts, for being such a strong, clear, guiding light. i miss you so much already. Rabbi Zalman Schachter led a wedding of Jewish hippies, “Michelle and Richie” out in Deadwood, Oregon on a farm in the mid seventies which was very memorable. It was a Native American/Jewish themed wedding. The couple who were living in a teepee, had followed the traditional purification practices and micvah baths he required, for weeks before the marriage. We had a women’s sweatlodge, and a men’s sweatlodge the night before. He paused and then said, “We are here to “witness” a ceremony. To “witness” something requires active participation from us as a group. We must have our “wits” about us, and be fully present. By our witnessing of the vows made by this couple, we become the container for these vows, the “glue” to cement, strengthen and support their desire to be united in marriage. So we must prepare ourselves before we are ready to actively perform this function. He asked one side of the aisle to chant, “One, One, One, One…”(over and over) and then he had the other side of the aisle chant “many, many, many, many.” He said we are many, and we desire to become fully present and aware of our unity and oneness to support Michelle and Ritchie. Then as we chanted “One” and “Many” he took out a flute and played a lovely melody for about 5 minutes. Then he brought it to a close and said, “Now, we are ready.” He motioned for them to approach, and they said prayers and lit a peace pipe with tobacco, and passed it as each person offered blessings for their union. We continued on with Jewish dances and Dances of Universal Peace, drank champagne, and ate carrot cake made in the shape of the four directions and the top layer in the shape of a six pointed star. We all left in an expanded state of consciousness. Rabbi Zalman Schachter-Shalomi, who was considered the spiritual father of the Jewish Renewal movement — an influential camp of religious pioneers who reintroduced to synagogue services ancient Judaic traditions of mysticism and meditation, gender equality and ecstatic prayer — died Thursday at his home in Boulder, Colo. He was 89. His death was announced by Aleph, an umbrella organization that represents about 40 Jewish Renewal congregations around the world, most of them in North America. Rabbi Schachter-Shalomi’s strain of Judaism had its roots in Chabad-Lubavitch, a branch of Hasidism that itself began as a revival movement in 18th-century Russia, drawing ideas from mystical Judaic texts like the kabbalah. But he traced the spark for his renewal movement to the intellectual and spiritual ferment he encountered on American college campuses in the 1960s. As an ordained rabbi of the Lubavitch movement, which sends emissaries around the world to keep the Jewish faith alive, he was dispatched to meet with secularized Jewish students throughout the Northeast. Along the way, he befriended fellow spiritual seekers like the psychedelic guru Timothy Leary, the Roman Catholic mystic Thomas Merton and Ram Dass (born Richard Alpert), an educator and proponent of hallucinogens and Hinduism. His exposure to Eastern religion, medieval Christian mysticism and LSD — he had the first of a handful of hallucinogenic experiences in 1962, under Leary’s tutelage — helped him formulate some of the innovations he brought to contemporary Jewish practice. From his LSD experience in particular he concluded that “what I’d experienced in prayer and meditation before — the oneness and connection with God — was true, but it wasn’t just Jewish,” he told the writer Sara Davidson, author of “The December Project: An Extraordinary Rabbi and a Skeptical Seeker Confront Life’s Greatest Mystery,” a book, published this year, about her conversations with Rabbi Schachter-Shalomi on aging and mortality. The Chabad-Lubavitch movement began distancing itself from Rabbi Schachter-Shalomi later in the 1960s, when he publicly praised what he called “the sacramental value of lysergic acid” — the basic ingredient of LSD — in a question-and-answer session after a lecture. By then he was introducing college audiences and members of a congregation he led in Somerville, Mass., to Judaism’s spiritual traditions of meditation, mysticism and devekut, a form of ecstatic prayer that incorporates singing, dancing and storytelling. He began translating Hasidic mystical texts into English. At the same time he formed a separate movement, P’nai Or (Faces of Light), which helped revive interest in the kabbalah among Jews and non-Jews alike. Accused of promoting a fad rather than a faith, he described his purpose as twofold: to enliven rituals that many young American Jews found stultifying, and to help restore what he considered Judaism’s lost legacy of ecstatic spirituality. Underlying both goals was a conviction that Jewishness had to evolve. His services took a less formulaic approach, offering a deeper spiritual experience to congregants while demanding a greater commitment to social justice and environmental activism. Some of his teachings and methods have been adopted to a greater or lesser degree by Reconstructionist, Reform and Conservative congregations. Rabbi Schachter-Shalomi became known for his ecumenical dialogue with Buddhists. In 1990, he was among a group of Jewish leaders invited to meet with the Dalai Lama in Dharamsala, India. Living in exile since 1959, the Dalai Lama sought their advice on how to keep his religious tradition alive in the Tibetan diaspora. His outreach to women was also groundbreaking. Citing a word that appears in early Jewish texts, “Shekhinah,” which is said to signify the feminine element in God’s presence, Rabbi Schachter-Shalomi advocated equality for men and women in all aspects of Jewish services. And he was among the first leaders of any Jewish denomination to ordain women as rabbis and to advocate full participation by gay and lesbian congregants. In 1993, his P’nai Or movement merged with a progressive Jewish political and environmental action group, the Shalom Center, founded by Rabbi Arthur Waskow, to form Aleph, the Alliance for Jewish Renewal, based in Philadelphia. Its seminary has ordained 80 rabbis since 1993. Meshullam Zalman Schachter was born on Aug. 17, 1924, to Shlomo and Hayyah Gittel Schachter in Zholkiew, a city that was then in Poland and is now part of Ukraine. He was raised in Vienna, where his father, a member of the Hasidic sect, was immersed in both Orthodox Judaism and the intellectual and political life of the city. With the rise of the Nazis, the family moved repeatedly — to Belgium, France, North Africa and the Caribbean — before landing in New York City in 1941. In 1956, Rabbi Schachter-Shalomi received a master’s degree in the psychology of religion from Boston University while serving as a congregational rabbi in New Bedford, Mass. After his estrangement from the Lubavitchers, he received a Ph.D. in theology from Hebrew Union College-Jewish Institute of Religion, a Reform institution in Manhattan. From 1975 to 1995 he was a professor of Jewish mysticism and the psychology of religion at Temple University in Philadelphia. He later joined Naropa University, a Buddhist institution, in Boulder, where he received an appointment to the World Wisdom Chair, a lecturer position. He is survived by his wife, Eve Ilsen. Married four times, he is also survived by 11 children. The author Rodger Kamanetz, whose 1994 book, “The Jew in the Lotus,” chronicled the rabbis’ meeting with the Dalai Lama, said Rabbi Schachter-Shalomi was always pained by his estrangement from Hassidism. And, he added, he was never comfortable with the nicknames that both Jewish and secular news media gave him: the hippie rabbi, the cyber rabbi (for his technological savvy), the gadfly rabbi. Schachter-Shalomi, better known as ‘Reb Zalman’ (a less formal title he preferred), was often a controversial figure in his lifetime, beloved of many and reviled by others. Those who loved him saw him as the visionary father of the Jewish Renewal movement, as a spiritual revolutionary who infused religion and inter-faith relations with a new vitality and contemplative depth. Those who opposed his innovative approach to Jewish spiritual practice felt he had betrayed the traditional values of Orthodox Judaism. Though this opposition diminished in his later years as former opponents came to appreciate his spiritual integrity and the need for new perspectives. But whether embraced or shunned, his impact upon Judaism and modern spirituality is undeniable. Beginning in the 1950s, Schachter-Shalomi addressed himself to the masses of disaffected Jews who found their own religious tradition bereft of spiritual depth in the wake of the Holocaust. Along with his friend and fellow revolutionary, Rabbi Shlomo Carlebach (d.1994), he set out to find Jewish youth ‘where they were’ and to show them the depths and options still available within Judaism. For his currency and participation in the spirit of the times, some dubbed him the “Hippie Rabbi” in the 1970s, just as in the 1990s, many called him the “Cyber Rebbe” for his mix of Hasidism and technological savvy. For the most part, Schachter-Shalomi’s success was based in his liberal acceptance of people exploring alternate paths of spiritual awakening (from LSD to Yoga), and his legitimizing of alternate possibilities within Judaism (from the rabbinical ordination of women to the acceptance homosexuals), and not least on his making available to them the deepest teachings of Jewish mysticism and meditation. Today, Jews the world over wear the B’nai Or ‘Rainbow Tallit’ (prayer-shawl) he designed, and Jewish Renewal rabbis and teachers are at the forefront of modern Judaism and its encounter with the changing nature of society. ALEPH: Alliance for Jewish Renewal, the organization he originally founded as B’nai Or Religious Fellowship, continues to serve the core of Jewish Renewal communities all over the world; and OHALAH: the Association of Rabbis for Jewish Renewal, originally begun by rabbis personally ordained by Schachter-Shalomi, meets every year for fellowship, learning and the ordination of new rabbis. From the earliest days of Schachter-Shalomi’s career, he was continually involved in ecumenical dialogue with leaders and practitioners of other spiritual paths, from Trappist monks to Sufi sheikhs. These frequent forays into what was then forbidden territory led Schachter-Shalomi to describe himself as a “spiritual peeping-Tom.” But far from being a mere browser, Schachter-Shalomi became deeply learned in the most minute aspects of the theory and experiential practice of these traditions, praying matins with the monks and performing dhikr with the Sufis. This deeply personal approach to dialogue led to significant friendships with many of the world’s great philosophers and spiritual teachers, including: Father Thomas Merton, Pir Vilayat Khan, Ken Wilber, and the 14th Dalai Lama. The twin peaks of this ecumenical work had to do with the increasingly significant dialogue between Jews and Buddhists. Always sensitive and sympathetic to Jewish involvement in Eastern traditions, in 1990, Schachter-Shalomi was invited to a meeting in Dharamsala, India, between the Dalai Lama and Jewish leaders, to discuss how Tibetan Buddhism might “survive in exile.” This dialogue, and Schachter-Shalomi’s remarkable influence upon it, became the focus of a best-selling book by Rodger Kamenetz called The Jew in the Lotus. Immediately, the book became a catalyst for Jewish-Buddhist dialogue and the sensitive issue of why so many American Jews were involved in so-called ‘Eastern’ spiritual paths. Despite his profound impact upon American Judaism, his renewal teachings are still only beginning to take hold in Europe and Israel. To many, he remains a misunderstood figure, representing far more ‘innovation’ than they are comfortable with, and yet ‘guilty’ of far less than they usually suspect. His father, a Belzer hasid with liberal tendencies, had him educated in both a ‘leftist’ Zionist high school and a traditional Orthodox yeshiva. In 1947, he received his rabbinic ordination from the ‘Lubavitcher Yeshiva’ (Yeshivat Tomhei Temimim) and continued the outreach and teaching work he had begun the previous year in New Haven, Connecticut. In 1948 or ’49, he began to travel to college campuses with Rabbi Shlomo Carlebach at the direction of the Sixth Lubavitcher Rebbe and took up a post as a congregational rabbi in Fall River, MA. From 1952 to 1956, he was a congregational rabbi in New Bedford, MA. In 1964, inspired by examples of Trappist spirituality, the Dead Sea Scrolls, and the Hasidism of his teachers, Schachter-Shalomi founded the neo-Hasidic B’nai Or Religious Fellowship with a small circle of students. By 1968, he had earned his Doctor of Hebrew Letters from Hebrew Union College and was effectively ‘divorced’ from the Lubavitcher hasidim over issues relating his controversial engagement with modern culture and other religions. Nevertheless, he continued on as an ‘independent’ hasid, teaching the experiential dimensions of Hasidism as one of the world’s great spiritual traditions. That year, he was also influential among the group who formed Havurat Shalom in Boston. A few years earlier, he had begun to study Sufism and meet with Sufis in California’s Bay Area. This eventually led to his being initiated and ordained as a Sheikh in the Sufi Order of Pir Vilayat Khan in 1975. That year, he also became professor of Jewish Mysticism and Psychology of Religion at Temple University, where he stayed until his early retirement in 1987, when he was named professor emeritus. 1984 saw the birth of a new period in Schachter-Shalomi’s life. That year, he took a forty-day retreat at Lama Foundation in New Mexico and emerged with a new teaching about “spiritual eldering,” which later developed into his popular book, From Age-ing to Sage-ing, and led to his founding the Spiritual Eldering Institute, whose work is now carried on by Sage-ing International. In 1986, B’nai Or (‘children of light’) Religious Fellowship became P’nai Or (‘faces of light’) Religious Fellowship, which would later undergo one more transformation and take up its current name, ALEPH: Alliance for Jewish Renewal. In 2004, Schachter-Shalomi participated in the Vancouver Peace Summit, where he gave an address to the session on “Balancing Educating the Mind with Educating the Heart” at the Chan Centre for the Performing Arts and dialogued with Nobel laureates, the 14th Dalai Lama and Bishop Desmond Tutu. He also co-founded the “Sufi-Hasidic,” Inayati-Maimuni lineage of Sufism, reviving the medieval tradition of Rabbi Avraham Maimuni and allowing the Hasidic lineage of the Ba’al Shem Tov to integrate with the Sufi lineage of Hazrat Inayat Khan. In 2005, he witnessed the creation of The Reb Zalman Legacy Project, an initiative of the Yesod Foundation “to preserve, develop and disseminate” his teachings, which eventually led to the donation of the Zalman M. Schachter-Shalomi Collection to the University of Colorado at Boulder in 2011 and the creation, in cooperation with the Program in Jewish Studies, of the Post-Holocaust American Judaism Archives in 2013. Since then, the University of Colorado has hosted an exhibit on his life and work, as well as a symposium on his influence upon Jewish music. His greatest interest in his last years was to articulate the foundations of a new manifestation of Hasidism, which he called “The Fourth Turning of Hasidism,” and to contribute to the evolving understanding of religion and spirituality. At the time of his passing, after hundreds of hours of dialogue on the subject, Foundations of the Fourth Turning of Hasidism, a short statement of principles written with a student, was being prepared for publication, the last writing he read and approved. A few of Schachter-Shalomi’s most significant books include: Spiritual Intimacy: A Study of Counseling in Hasidism (1991), Paradigm Shift: From the Jewish Renewal Writings of Reb Zalman Schachter-Shalomi (1993), From Age-ing to Sage-ing: A Profound New Vision of Growing Older (1995), Jewish with Feeling: A Guide to Meaningful Jewish Practice (2005), A Heart Afire: Stories and Teachings of the Early Hasidic Masters (2009), Sh’ma’: A Concise Weekday Siddur for Praying in English (2010), Gate to the Heart: A Manual of Contemplative Jewish Practice (2013), and The December Project (2014). He is survived by his wife, Eve Ilsen (married in 1994); ten children, Mimi Gess of Israel, Shalom Schachter of Toronto, Joseph Schachter of Calgary, Yale Schachter of Vancouver, Tina Duskis of New York, Jonathan Schachter of Vancouver, Lisa Vito of Vancouver, Shalvi Schachter of Israel, Barya Schachter of Israel, and Yotam Schachter of Boston; and his child by donation, Rosi Greenberg of Philadelphia; numerous grandchildren and many great-grandchildren; a brother, Joseph Schachter of Israel, and a sister, Dvorah Kieffer, also of Israel. As the week goes on, and despite events in Israel and so many other things, I remain profoundly aware of the death of Reb Zalman, may his memory be for a blessing. A sense of him and the memory of him is never far away. He had such a beautiful voice, his beautiful accent, and those twinkly eyes. He was irrepressible, joyous, and a font of ideas and connections. It was a pleasure and a challenge to try to keep up with him and his richly associative mind. His presence continues to echo. I will miss him very much. He was intimately involved with Hazon and our programs over many years. The staff at Isabella Freedman loved him; he made it a habit always to meet with the behind-the-scenes staff, not just front-of-house folk. He taught at Shavuot, was a central figure at Elat Chayyim since its earliest days, was a very special presence at our benefit last year, and came to England with us for a climate change conference a few years back. He was deeply interested in, and supportive of, our work on shmita. And he and Eve have been incredibly kind and generous to me personally. So I wanted to take this moment to remember Reb Zalman, to offer condolences to all those who feel his loss, and to share one of his teachings for those who never knew him. What I found most fascinating and inspiring was how he bridged and connected between the tradition, on the one hand, and openness, creativity and change on the other. In watching how one’s rebbe ties his shoelaces, this, above all things, was what I learned from Reb Zalman. I remember in particular a rather remarkable teaching he gave at Elat Chayyim, in 1998. He was with the rabbis and rabbinical students of the Jewish Renewal movement. I was struck, over many years, by what a curious relationship he had with them. He was very proud of them, and very conscious of having established a legacy which he believed in, but simultaneously I think he sometimes also felt slightly constricted by them. To the end he was eclectic in his interests and his affiliations. In his teaching the orthodox, or perhaps the ultra-orthodox, were like the heartwood; the Jewish Renewal movement was the outer growing edge. This is a fascinating analogy, and it is important to understand it. On the face of it, his words could be understood offensively in either direction. It could be offensive to the orthodox – to say that the orthodox world is in some sense “dead.” And it could be offensive to the renewal movement: to suggest that it cannot stand by itself, that it is in some sense reliant on the orthodox or the ultra-orthodox. Yet Reb Zalman, in saying this to the leaders of the Renewal movement, was saying something very profound. He was arguing for us to understand Jewish life as a complex ecosystem, which is what a tree, all by itself, is. This idea underpinned how he understood the world, the different elements of Jewish life, and the Jewish community within the wider world. Reb Zalman’s understanding was that we each of us – each of us as individuals; and also each of us as distinct communities – has a unique gift, that is ours to share and to offer. And we need to understand not only the distinctiveness of our own gifts, but the extent to which they are reliant upon the different gifts of others. This was what he was saying to the Renewal movement: the Jewish community needs you to innovate, to be creative, to develop new liturgy, new theology, to incorporate feminism and eco-theology and the wisdom of the Sufis and the Buddhists and the Christians. But in doing this, do not forget that the tree of Jewish life is at least partially upheld by the institutions of orthodoxy and tradition – shuls, mikvaot, yeshivot, a range of institutions that change far less, or more slowly, but upon which the growing edge partly depends. And he would have said, equivalently, to the orthodox: you may not (yet) feel able to incorporate certain sorts of changes. But do not doubt that your world is enriched by the innovations of others. When we count the rings of a tree, we see that what was a new ring 20 years ago is now incorporated today within the body of the tree. And so it is, for instance, with bat mitzvah, or, as we saw last week, with an orthodox woman very publicly saying kaddish – innovations that began with Reb Zalman, or Mordechai Kaplan and which have now begun to be incorporated into orthodoxy. This metaphor of Reb Zalman’s is so needed in the world today. It requires of us, at its heart, to be able to see the value and the necessity of the work and the ideas of people with whom we may not agree – that is what he was teaching. This is a radical idea. It is true in relation to Jewish life. True in relation to Israel. There are people and organizations out there – for each of us – that we do not directly “believe in” or support, but which – in fact – play a vital role in the ecosystems in which we thrive. Blessings and love to Eve, to your children and grandchildren, to your students of all sorts around the world. May we be inspired by your teachings, by your kindness, and by that twinkle in your eye; also by the dollar coins you gave out, the Torah you taught, and the link that you represented in an ancient and beautiful chain. PS: If you have not yet read it, the very beautiful December Project by Sara Davidson is not only an extraordinary book on preparing for death; it is also a very lovely biography of Reb Zalman. What an enormous heart and generous spirit! I was so inspired by Reb Zalman’s talk at the 2011 Sufi Order summer gathering in Colorado. As a maker of music inspired by many faith traditions, I felt his call for a uniquely American form of qawwali singing pierce my heart. In response, I sent him a note and a copy of my brand new recording. Much to my amazement, just a week later, I got an email from his assistant saying, “Reb Zalman loved your CD and wants to speak with you.” He and I ended up talking on the phone for almost an hour. He was so generous with kind words and encouragement. He gave me precious pointers on singing nigguns (wordless sung prayers), and I was in bliss as he sang them to me over the phone. So sweet! When I asked if I could use a quote from him in promotional materials, he said, “Of course! That’s why I’m telling you these things!” What a blessing he gave me. It is also a sign of his great generosity of spirit that such a busy, famous person gave this unknown singer/songwriter and chant-leader such personal attention, encouragement, and inspiration. Thank you dear Rebbe for the great blessings you gave the world! May peace be upon you! Although I did not know Rebbe Zalman personally, I feel deeply grateful for the way he devoted his life to bringing greater depth of feeling for the holiness of each individual, and of all religions into the sphere of Judaism. His love and devotion to all of life as it is, as we are, expresses the way he lived the essential Jewish mitzvot (commandments). He took the true meaning of our single most important prayer, the Shema most deeply into his heart, and made sure he exemplified its essence. “Listen, Oh Israel, the Lord our God, the Lord is One. Perhaps now, more than ever the Jews of Israel need to learn about the way Rebbe Zalman lived, and to spread the light of universal love to our Arab Palestinian brothers and sisters. Thank you, Rebbe Zalman for spreading your gentle, yet powerful form of love to our world so courageously and faithfully. Thank you for spreading your personal and universal light onto each and all of us. When I was about to leave Philadelphia to go to California (driving in a little Sufi caravan) I made a date to visit him before I left. I’d gotten to know him after Pir Vilayat initiated him, when some time later he began giving Sangatha classes at his home in Mt. Airy. I attended some B’nai Or events there as well, and Reb Zalman became an important mentor to me. That’s Reb Zalman–making the mundane holy, making a cross-country trip to the Bay Area a blessed journey to deliver the Rebbe’s gift.